One of the loneliest voyages in Montana, the Big Sheep Creek Backcountry Byway is a fifty-five mile excursion through one of the most remote, and seldom visited, areas of Montana. For those seeking to “get away from it all,” or who simply want to disappear for days or weeks at a time and live without a care in the world, the region of Montana that the Byway passes through is the place to visit. Located in the far southwest corner of Montana along the Idaho border, the Big Sheep Creek Backcountry Byway is a true “backcountry” excursion in every way. The vast majority of the route not only passes through an uninhabited part of Montana, but a landscape that features no signs of human habitation whatsoever. Highlights of the Big Sheep Creek Backcountry Byway include Big Sheep Creek, the Tendoy Mountains, the Beaverhead Mountains and the Continental Divide, and the massive Medicine Lodge Valley. 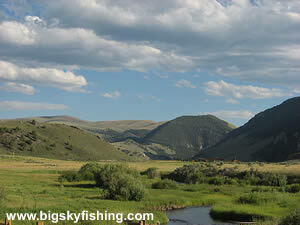 The Big Sheep Backcountry Byway runs between the town of Dell, Montana, and Highway 324 near Clark Canyon Reservoir. The byway follows gravel roads for its entire distance. Somewhat surprising considering the remote and isolated terrain, most of the road is two-lane and is usually in great condition. Readers of this article, however, should note the use of the qualifier “most” in the previous sentence. Although about fifty miles of the road is in excellent condition except during the mud season or following prolonged rain events, there is a short five-mile two-track dirt road section that is not maintained and basically becomes nearly impassable when wet. During the summer, this short five-mile section usually is passable using a normal vehicle without too many problems. However, even a little bit of moisture can turn this dirt road section into a hopelessly slick and muddy quagmire. So, the moral of the story is, be sure the weather forecast is dry before venturing out into the Big Sheep Creek Backcountry Byway if you will be using a normal passenger car or one lacking four-wheel drive. 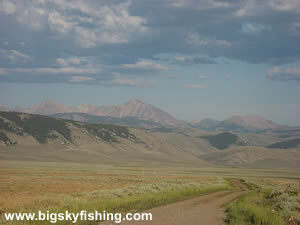 The Big Sheep Creek Backcountry Byway begins just outside the town of Dell, off the Westside Frontage Road. The beginning of the byway is well marked, although there is no signage on the Interstate itself about the drive. Initially, the Big Sheep Creek Backcountry Byway travels through an open valley, gaining elevation as it approaches the Tendoy Mountains. 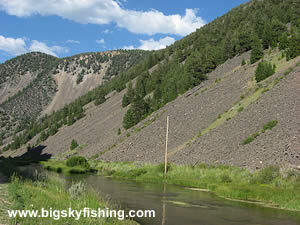 After a few miles, the road reaches Big Sheep Creek and enters Big Sheep Creek Canyon. For the next 10 or so miles, the Byway twists and turns through this beautiful canyon as it closely follows Big Sheep Creek. There is some fine trout fishing in spots along Big Sheep Creek, so those with fishing gear and some time should try their luck. Beyond this somewhat confusing road junction, the Big Sheep Creek Backcountry Byway soon enters a vast, empty, lonely and incredibly large valley called the Medicine Lodge Valley. This valley, at least to me, defines the term “empty” when it comes to geographical locations. From this valley, the Beaverhead Mountains and the Continental Divide rise steeply to the west, while the Tendoy Mountains rise to the east. And nowhere within this massive valley is there any sign at all of human habitation, past or present. Despite the lonely valley, the road in this section is in just as good condition as it was at the beginning of the drive – perhaps even better since nobody ever comes here. However, about midway up the valley the road condition changes abruptly. At yet another confusing road junction, the good condition road comes to an abrupt halt while two bad condition two-track dirt roads veer off to the right and left. Go right for the Big Sheep Backcountry Byway. During the summer, the two-track dirt road should be in ok condition provided there’s been no recent rain, although some ruts will have to be negotiated around by low-clearance vehicles. This two-track dirt road, called the Medicine Lodge Road (I think), leads past the sole development out in the valley, a long-ago abandoned homestead. For the next few miles, the two-track lazily meanders through the valley and provides some wonderful views of the Beaverhead Mountains. The last two miles of the dirt road are probably the worse in terms of driving and road conditions. In particular, there’s a very steep hill that needs to be climbed and which likely will prove to be very difficult for any vehicles towing a trailer due to all the bumps and rocks in the road. At the top of this hill is a sign pointing out the existence of the Old Bannack Road. From here, the road only gets worse for the next few miles. Although the two-track dirt road “sort” of ends, the next few miles are a rutted, nasty, bumpy drive on a not very pleasant gravel road. Low-clearance vehicles will have to be especially careful on this stretch, as all sorts of rocks inconveniently stick up out of the ground. Happily, this nasty part of the drive only lasts a few miles, even if it might seem like a hundred. Soon the road turns back into a wide, two-lane gravel road that is smooth and in fine condition. For the remainder of the drive to the junction with Highway 324, the road skirts along the western side of the Tendoy Mountains, passing a few remote ranches, too. Overall, the Big Sheep Creek Backcountry Byway is the place for those with an adventurous spirit to visit. The scenery is excellent, and the views are truly sweeping. And for those seeking to avoid the crowds found in more popular places of Montana, the Big Sheep Creek Backcountry Byway is a great route to follow since it psses through one of the most regions of the state. Road Type : Gravel, ranging from good-condition to rough. 4wd needed? : No, except during mud season or periods of extended wet weather. However, a high-clearance vehicle is needed for parts of the drive where the road is essentially not maintained. Trailers? : Yes, for most of the drive. The unmaintained portion of the drive has a few spots where trailers will be problematic. Season : Most of the drive is not maintained for winter travel, but there are no gates barring access. So travel during the late-fall/winter/early-spring period is allowed IF you feel daring (or lucky) and want to try it! The map below shows the route and location of the Big Sheep Creek Backcountry Byway in Montana. There are no services of any kind along the Big Sheep Creek Byway. The town of Dell has a gas station and conveniene store, and there's a small marina near the northern end of the byway on Clark Canyon Reservoir. The best place to find services, including lodging, for anyone in this part of Montana is in Dillon. Camping areas are abundant along the drive. Although no designated camp areas exist, there's endless primitive camping spots.